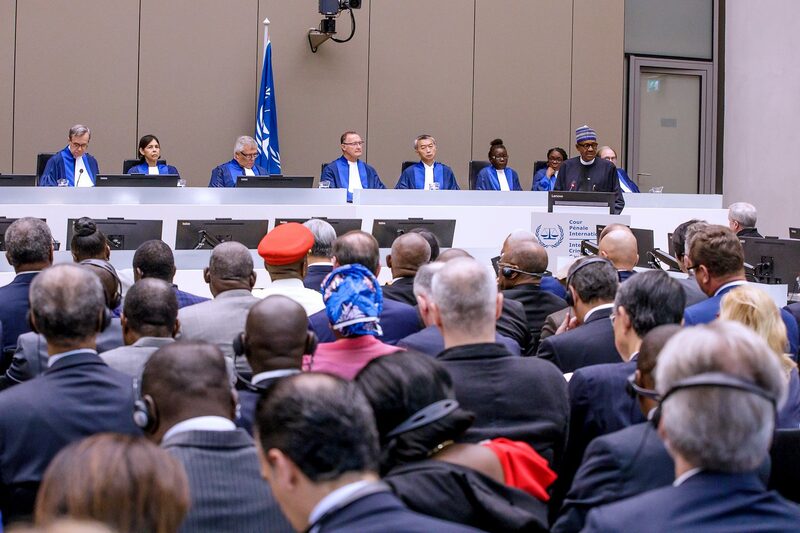 Nigeria has cooperated with, and supported the Court at all times… Our cooperation with the Court is borne out of our strong belief in the respect for the rule of law and human rights, and in our firm commitment to the sanctity of fundamental freedoms at international and domestic levels, as ingrained in the objectives for establishing the Court. As we know, the International Criminal Court was established twenty years ago as a global court, inspired by the Nuremberg trials of World War II war criminals, to hold people accountable for crimes against humanity, war crimes, crimes of genocide and aggression. In addition to preventing impunity, promoting adherence and respect for the rule of law and fundamental freedoms worldwide and to punishing those in leadership positions responsible for the most appalling crimes and atrocities, the ICC has given hope for justice to so many, by demanding strict adherence to the rules of international humanitarian law. With the alarming proliferation of the most serious crimes around the world, the ICC, and all that it stands for, is now needed more than ever, in ways that were unforeseeable to its founders. The ICC may have been created at a time of optimism that it would not need to be utilised frequently, but unfortunately, the increase in international crimes has only increased the Court’s relevance. Indeed, while limits on the ICC’s jurisdiction mean that it cannot presently act with regard to some of the dire crises of the day in states that are not parties, by acting where it can, the ICC reinforces the demand for justice far beyond its own cases. A strong and effective ICC has the potential to send a powerful message about the international community’s commitment to accountability, a message that will be heard by both victims and perpetrators. Equally, a strong and effective ICC demonstrates the international community’s commitment to the rule of law. I urge all states that have not yet done so to, as a matter of deliberate state policy, accede to the Rome Statute of the International Criminal Court so that it can become a universal treaty. A strong and effective ICC can also act as a catalyst for other justice efforts, expanding the reach of accountability. These could include serious cases of corruption by state actors that severely compromise the development efforts of countries and throw citizens into greater poverty. These could also include cases of illicit financial flows, whereby countries are complicit and obstruct repatriation of stolen asset. As the African Union Champion on Anti-corruption, these are issues dear to my heart. The ICC also needs increased cooperation and financial resources from its member states. State parties should express their commitment to increasing efforts in these areas, including pledging concrete assistance. The twenty years of the Court’s existence have witnessed several challenges, some of which had threatened the very existence of the Court itself. Most notable were the withdrawals and threats of withdrawals of membership of the Court by some states, as well as accusations of bias in the exercise of the jurisdiction of the Court. Thankfully, the Court has addressed these challenges in a dignified and commendable way. Nonetheless, the Court needs to take on board all constructive criticisms and allay lingering fears and concerns through targeted messaging, awareness raising and possible modification of some legal provisions. If properly articulated, communication and awareness raising would surely engender trust and encourage greater cooperation of member states with the Court and even encourage non–Member States to decide to become Members. It must avoid even a hint of bias or political motivation. …let me intimate you that Nigeria is preparing to conduct general elections in 2019. Contrary to the tragic incidents that characterised the 2011 general elections in Nigeria which necessitated preliminary investigations by the International Criminal Court, I assure you that all hands are on deck to prevent any recurrence of such tragic incidents. The goals and responsibilities of the Court are no doubt very challenging and daunting but with the cooperation of all, coupled with the high calibre of Judges and staff of the Court, the challenges are not insurmountable. I, therefore, urge all states not to politicise the decisions of the Court but to always bear in mind the rationale for the establishment of the Court in the first place. Nigeria has cooperated with, and supported the Court at all times. This, we have demonstrated by our full and transparent cooperation on matters on which we are being investigated and also in our several country statements at the sessions of the Court. Our cooperation with the Court is borne out of our strong belief in the respect for the rule of law and human rights, and in our firm commitment to the sanctity of fundamental freedoms at international and domestic levels, as ingrained in the objectives for establishing the Court. In conclusion, let me intimate you that Nigeria is preparing to conduct general elections in 2019. Contrary to the tragic incidents that characterised the 2011 general elections in Nigeria which necessitated preliminary investigations by the International Criminal Court, I assure you that all hands are on deck to prevent any recurrence of such tragic incidents. We shall do everything possible to ensure that Nigeria witnesses the conduct of free, fair and peaceful elections in 2019. Again, I congratulate the Court on its 20th Anniversary and wish it continued growth, relevance and success in the years to come in its vital role as a bulwark against man’s inhumanity to man. Muhammadu Buhari (GCFR) is president of the Federal Republic of Nigeria. This is the text of the Keynote Address delivered on the occassion of the 20th Anniversary Celebration of the International Criminal Court at The Hague, Netherlands.